A Maryland state board has voted to build a new $765 million Potomac River crossing in Charles County to replace the aging Harry Nice Bridge. NEWBURG, Md. 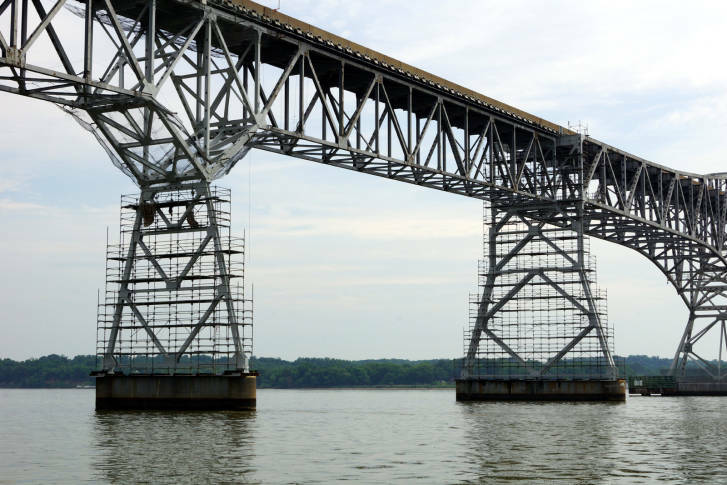 (AP) — A Maryland state board has voted to build a new $765 million Potomac River crossing in Charles County to replace the aging Harry Nice Bridge. The Maryland Transportation Authority Board voted unanimously for the project Monday in Newburg. Under the plan, construction would begin in fiscal year 2020 and the new bridge would open to traffic in 2023. Plans call for building a new four-lane bridge north of the existing bridge that carries U.S. 301 over the Potomac River. It connects Charles County in Maryland and King George County in Virginia. A bike and pedestrian path will also be included. The project would be funded with Maryland Transportation Authority cash as well as debt. “From day 1, we have been 100 percent committed to replacing the Nice Bridge. We have always been and remain fully committed to completing this project in the most affordable, most efficient and most expeditious manner possible,” Hogan said. He said the new span would open seven years sooner than a legislative plan to address the bridge called for. Changes in the design plans are expected to save the state money – original estimates to replace the bridge neared $1 billion.